The Abbington Villas are located directly across the street from the beach and offer views of Palmetto Dunes 11 mile lagoon system. The Barrington Arms/Court Complex, with an on-site pool and spa, offers spectacular ocean and pristine garden views. The Beachside Tennis condos are located in South Beach. The Villas offer beautiful beach views and are just steps away from shops, restaurants, fishing, kayaking, and nightly entertainment. The Beachwalk section of the plantation has an on-site pool and is located just a very short walk from the beach. In addition, the golf and racquet clubs are close by. The Breakers is a 3-story oceanfront complex with an oceanfront pool. The Breaker complex is within walking distance to Coligny and is close to everything. With an Oceanfront pool, the complex is a quick min. down to the beach! Sea Pines Plantation is Hilton Head Island's original and largest planned resort. While it is currently the home of the Heritage Golf Tournament, it is the abounding natural beauty that beckons one to return again and again. The Captains Walk oceanfront complex has an on-site pool, a kiddy pool, a cabana, a sun deck, and a boardwalk to the beach. 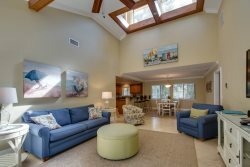 The Colonnade Club, a wonderful vacation destination within Shipyard Plantation, is surrounded by tennis and golf, is close to the beach, has an on-site pool that is open from April 15th through September, pool house, and heated spa. Cottages is located in the naturistic Shipyard Plantation on Hilton head Island, and is absolutely perfect for a soul-searching getaway, a girls weekend, a small family vacation, or a quick guys golf excursion. Courtside is an ocean-oriented condominium complex. Enjoy a short walk to Forest Beach, tennis courts, shops, restaurants, and vacation activities. Convenient parking at the front door. The beach is a quick walk away, but if you're tired of the sand, you can always dip into the refreshing pool. Devonshire also offers a community charcoal grilling site nestled on the banks of the picturesque lagoon, complete with picnic tables. Evian, a popular vacation destination within Shipyard, is an oasis of serenity in itself. An old fashioned gazebo and numerous benches, overlooking the 5 acre lake with its sweeping footbridge, provide an unsurpassed view of native wildlife. The nearby olympic-size pool is open year round, and is adjacent to the 6, free and lighted, tennis courts. The lush lagoon and golf course view make Fairway Lane units a relaxing retreat. The beach path access is across the street from the complex and is approximately a 5 minute walk to the beach. Fazio Villas have an on-site pool and are only a short walk to the beach or the tennis courts. All beach distances are measured from the center of the complex. The Forest Beach Villa complex is on the "inland" side of South Forest Beach Drive, just off Coligny Circle. It is a 5-Story building with angled walls, internal halls, and elevator access. The Greens area of Shipyard Plantation features spacious townhomes with golf views, a short .5 walk/bike ride to the beach, and a newly renovated private on-site pool. The Golfmaster area of Shipyard Plantation features spacious townhomes with golf views, 1.5 mile walk/bike ride to the beach, and private on-site pool. Hampton Place is the Dune's newest resort and has luxurious amenities including two large pools with sundecks, a child's pool, and a hot tub. A fitness center is available to guests of this complex. The Harbourside Villas of Palmetto Dunes features spacious villas with Harbour views, quick and easy walks to the Shelter Cove park, the Hilton Head Art Center, restaurants, a hop and a skip to the Shelter Cove Harbour, as well as, all access to the Palmetto Dunes plantation, and private on-site pool. The Hickory Cove Villas have large deck , modern design, and are spacious. There is a complex pool and the villas are 1/2 mile from the beach. The Huntington Villas have screened porches , modern design, and are spacious. There is a complex pool and Spa. These Villas are right across the street from the beach and are a quick 5 min walk down to the Atlantic Ocean. The Inverness Village area of Palmetto Dunes Resort has an on-site pool, which is open April through September, on-site tennis courts, views of the Fazio golf course, and a short bike ride or a 10-minute walk to the beach. The Mid-Island area of Hilton Head, located between Palmetto Dunes Resort and Port Royal Plantation, offers close proximity to uncrowded Atlantic Ocean beaches, restaurants, shopping, and family entertainment centers. Island House is a villa complex with in South Forest Beach on Hilton Head. These large villas are just down the street from the Van Der Meer Tennis Center and are just a 5 minute walk to the beach. There is a community grill and large pool on site for guest use! The Links is located in the Villages of Port Royal near the Marriott Barony and Westin Hotel. The complex has easy access to the many bike paths on the island and offers a community pool. The Moorings complex, within the Palmetto Dunes Resort, is very close to the beach and also features an on-site pool that is open April through September. Built in 2001, North Shore Place occupies the inside corner of Avocet Street and North Forest Beach Drive, where its imposing stone stairway faces the beach. Coligny Plaza is just next door. The complex has a dramatic rooftop pool and have access to the Sea Crest pool and beach access across the street. Ocean Breeze Villas are townhouse style condos. There are 2 and 3 bedroom models and parking is just outside each door in a private lot. There are 2 pools for guest use and the villas are a quick 5 mins down to the beach. Ocean Club consists of 52 villas on the Ocean Side of South Forest Beach on Hilton Head. Coligny Plaza is just down the road and the beach is a few steps away. Ocean Cove Villas are located in Palmetto Dunes and feature a community pool. Close to the beach and bike trails are just a few mins away. Ocean one Villas are just South of Coligny Circle, next to the Holiday Inn Oceanfront. Villas are in a 5 story building behind an oceanfront swimming pool. There is a central private parking lot. These beautiful Villas are just steps to the beach. Close to the beach, Lawton Stables, all of Harbour Town, the marina, grocery store and boutiques, and three golf courses, Plantation Club is in the perfect location to enjoy everything that Sea Pines has to offer. The Queens Grant section of the resort has an on-site pool that is open April through September, is a short bike ride to the amenities of Shelter Cove, and is a 10-minute walk from the beach. The Sea Crest Villas are an upscale oceanfront complex which has three attached wings with 5 floors over a gated parking area, The courtyard area is luxuriantly landscaped, with pathways meandering around lagoons with spouting fountains. The Villas are just mins to the beach and offer partial views of the ocean. The Shipmaster area of the plantation has an on-site pool, free tennis, and is a short, leisurely, 10 minute walk down the scenic bike path to the beach. Shorewood, an oceanfront complex on South Forest Beach, has an on-site pool that is heated from Oct 1 - Nov 30, and March 1 - Apr 30, a kiddy pool, stunning landscaping, and is only one block from Coligny Plaza. St. Andrews Commons in Palmetto Dunes has an on-site pool which is open from April through September and the complex is only minutes away from the beach. The Tennismaster section of Shipyard Plantation has an on-site pool and it is only a short stroll to the beach or tennis club. Villamare, an oceanfront complex within Palmetto Dunes Resort, features an oceanfront pool and hot tub, an indoor heated pool, a fitness center, a sauna, and of course, the beach! Outdoor pool heated March 15th to June 1st. The outdoor spa is heated year round. There is also a kiddie pool. Waterford is located near the front of Shipyard Plantation. Each unit backs onto the golf course creating lush views. The complex pool is just steps from each villa. Waterford is located a short bike ride to the beach.